It was not entirely unexpected, but in the end you always tend to think that bright minds like Terry Pratchett will live forever. Yesterday, the creator of the Discworld and so much more passed away much too early after a fierce battle with early-onset Alzheimer’s disease. He had talked about and even documented the effects of his illness openly and advocated assisted suicide, but in the end the tall skeleton with the scythe seems to have come without an appointment. He leaves behind a huge legacy of a whole universe with innumerable stories and characters, who are now in the capable hands of his wife Lyn and his daughter Rhianna. The last posts on his Twitter stream, written by his daughter, could not be more fitting, but only time will tell if this is really The End. There is certainly nobody else who could fill Sir Terry’s shoes, but there is one more unpublished book scheduled for this fall – The Sheperd’s Crown will be the 41st Discworld novel and the fifth one featuring the young witch Tiffany Aiching. There are not many other open plotlines – in his last few books Terry Pratchett already seemed to have worked on a kind of closure of the Discworld universe without shutting any doors completely. But it is highly doubtful that someone else could continue the Discworld. Even Pratchett’s daughter, who is a writer herself, has often said that she would not be able to continue her father’s works, although she is working on a coming television series based on the Ankh-Morpork City Watch. This is where the Discworld could live on – in adaptations of all forms and shapes. Note: Author photo respectfully borrowed from his sadly defunct site here. 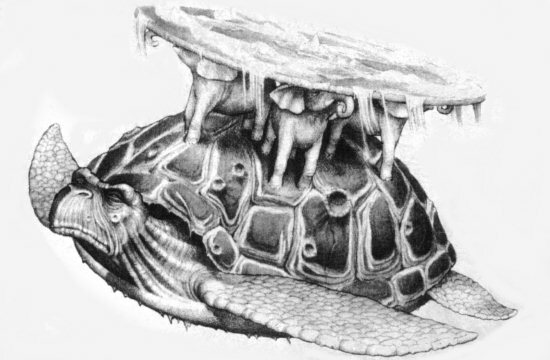 Turtle drawing by Paul Kidby, scanned from the cover of The Discworld Mapp. This is another edition of my now regular articles about the crew changes on the International Space Station – it’s Spring again and that means some astronauts will be leaving soon while others will be arriving later this month. A very successful and exciting Expedition 42 is soon coming to an end, but Expedition 43 is promising to be even more interesting with the arrival of the first two-astronaut crew who will be staying for a whole year instead of just six month on the station. As usual, I just like to keep an overview of who is up in space and I hope to continue these articles with the next one probably due in autumn.